Siga Cavey e outros na SoundCloud. Check out the new single from London’s alt/rock band, Cavey. 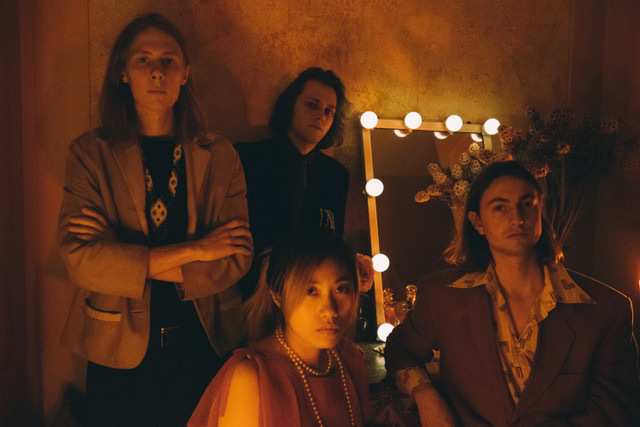 Entitled ‘About To Start’ the single produced by Blaenavon’s Frank Wright is a bluesy, soul ballad which thematically focuses on the unfulfilling side of life as a musician, the tumultuous nature of which inevitably leads to heartbreak. Having garnered both critical and commercial acclaim from publications such as Wonderland Magazine and DIY Mag, as well as having performed to numerous sold out venues across the nation, Cavey are set to make a powerful mark on the alt-rock scene. Cavey are a London based alt-rock four-piece consisting of Luke Cave (Guitar, Vocals), Alexander Chalstrey (Piano, Organ, Rhodes), Chun-Ting “Refa" Wang (Upright Bass, Bass guitar) and Adrian Ortman (Drums). Cavey’s influences range from the bluesy guitars of T-Bone Walker to Daniel Rossen of Grizzly Bear, whilst the rhythm section of the band add subtle jazz inflections, giving Cavey their signature style and captivating listeners. Both live and recorded, the band is a unique and compelling fusion of unrefined talent and dynamic energy, using little in the way of production or effects. The focus of this project are the players themselves and all are given space to demonstrate their characters and instrumental prowess. The band combines classic sounds and inventive songwriting to create their own brand of soulful, contemporary rock’n’roll. Cave reveals, “The sounds might be vintage, but we aren't trying to recreate anything. The subject matter is real and we're making something new”. Cavey has established a sound of musical maturity within their textural arrangements and lyrical imagery. Leading single ‘About To Start’ is a bluesy, soul ballad which thematically focuses on the unfulfilling side of life as a musician, the tumultuous nature of which inevitably leads to heartbreak. Highlighting the band’s use of storytelling lyricism, the single glistens with warm vocals, cinematic soundscapes and embellished jazz flairs. Produced by Frank Wright (Blaenavon), the band's unadulterated sound comes from the use of authentic musicianship and live recording techniques. Cave explains, "We always try and track live as much as possible to capture the feel of the band. Our view is that the emotion of a recording is in the performance”. Cavey are set to make a powerful mark on the alt-rock scene, following the success of their debut EP Night Time. Having garnered both critical and commercial acclaim, performed to numerous sold out venues, as well as being recognised by DIY Magazine as “Hypnotic and impressively fully-formed”, Cavey continue to ignite excitement with the release of ‘About To Start’ due November 2018.